Watson did an awesome job this morning romping with the Med. Rollers. With such a nice demeanor its no surprise that this cute pup is from Canada. 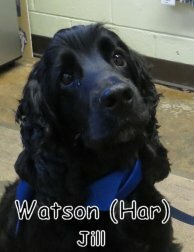 Regularly attending daycare in Vancouver has set him up great for tons of fun here at Fort Fido. Also, as our first Canadian fort friend, he is setting the bar high for future visitors from our neighbor up north! It was truly a pleasure to meet this pup today, and hopefully they return soon, so that we get another chance! Thanks for reading and be sure to check in on Monday for this weekends assessments! Meet Ruby! 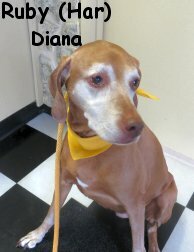 She is a sweet, eleven year old, about fifty pound, red & white colored Vizsla. Ruby hung out with us this morning in the Big Roll. She basically just meandered about, meeting and greeting with different members of the pack. After a little while, Ruby seemed to settle in and enjoy the experience. We hope to see a bit of play out of this Senior Gal in the future. These Vizslas are really neat canines, and lucky for us here at The Fort, we have several that attend. Awesome job today Ruby, now rest up, cause we shall see ya again this weekend for some Overnight Boarding. Checkout these three beauties resting in a patch of sun... Actually, they are a few of our most rough and tumble male Big Rollers lol! Here they're taking a rare break from the action. Gage, Theodore, and Zipper, three dapper dogs, one great photo op. Get a load of new puppy-boy Bob Marley "Jammin" with the wild and wonderful Sahale in the Medium Roll. Max was getting in the mix as well. My band and I just returned from the Bitterroot Highland Games in Hamilton Montana. It was an amazing weekend, lots of Pipe Bands, lots of fun, and, believe it or not, lots of dogs! I was able to meet and greet with several different "Celtic Pooches" including; Irish Wolf Hounds, Corgis (Pembroke and Cardigan), Shetland Sheep Dogs, Collies, Scotties, and Westies, just to name a few. I also witnessed many "Dogs in Kilts", which if you haven't seen, can be quite a hilarious site... Yeah... If you haven't seen any, well here you go! P.S. OK, OK, those last two are skirts. LOL! Happy National Dog Day from all of us here at FortFido! I hope you all have a great day and get a chance to spend some time with your wonderful dogs! On another note, here is a great clip of our buddy Louis with the herding ball last week. It sure is entertaining to watch a dog having so much fun with one of these! We'll start off with a blog written from a dogs' point of view, covering funny articles about dogs in the news, or at least dog related articles. Cerberus, the guardian of the gates of Hades, in Greek and Roman mythology or at least in this sense, guardian of his food dish, is a great idea for any pooch with a larger attitude than body! How about a pirate and his first mate, hiding the beloved treasure of bones and chewy toys! After the wonder years lol! Use the Force, to fill my food dish! For more doggie costume ideas, check out this site! Thanks again for reading, I hope you got at least a few good chuckles, check back Monday for more of Fort Fido's Blog. Detroit's stray dog epidemic - Yikes, shocking numbers! As if that city didn't have enough problems already eh? Pesky cat bugs sleepy dog (Video) - Classic lol. That's almost just like Hobbers & Gibson interacting. People using fake service dogs - The folks that do this are the epitome of "lame", well, at least the epitome of the slang version of that word haha. Someone truly "lame" would be able to justify their service animal. I don't know about y'all, but Hope and I have discussed this many times before. We've both ran into folks out there faking a service dog... It's sad to say the least. Dog Surf-A-Thon - I always love checking out Surfing Dog pics, they're just hilarious. Dog's blood saves the life of a cat (Video) - Amazing! Florida Dog Hangs 20 at the beach (Video) - Yes! I found more surfing dogs. Woman reunited with dog stolen five years ago - Wow, that is awesome, the odds were definitely not in their favor. Jennifer & Sasha, talk about two "lucky dogs". Do you give your dog a bath at home? Sometimes I do. Other times, I take my pooch to The Soggy Doggy in University Place. For me, it is much faster, easier, and, I don't make a big old mess at home. Give the place a try and see how you like it. You've probably heard about Bo, the Obama family's first pup, a Portuguese Water Dog. Now, get a load of Sunny, another young and good looking Portuguese Water Dog. Wow! The First Family is really into this breed, but, I get it lol, they are pretty neat canines. Cute stuff, I wonder if the dogs can play alone outside? Or do they too need a body guard(s) lol? P.S. Ya know, The Fort also has a wonderful little Chocolate Colored PWD... Kona! Here she is playing hard with Gracie a while back. Last Saturday we had the pleasure of meeting Captain, a 4 1/2 year old, Lab/Greyhound mix. Captain spoke great "dog" and was very friendly, he almost immediately started playing with all the dogs in the big roll but especially enjoyed playing with Zipper. 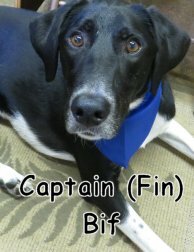 Captain's owner, Bif, is a long time Fort Fido customer who also has a dog named Luther. Be sure to check out "Luther's Adventure" for an incredible story! This morning at The Fort, we got to assess a couple of really neat pups! Sam, the 5 month old cream Shiba Inu (who could pass for Yuki's twin). A high spirited and energetic pup that did great, romping in the Med. Roll. with other Fido friends, Walter, and Beau. Another great addition to an already great pack. Hope to see you back very soon! 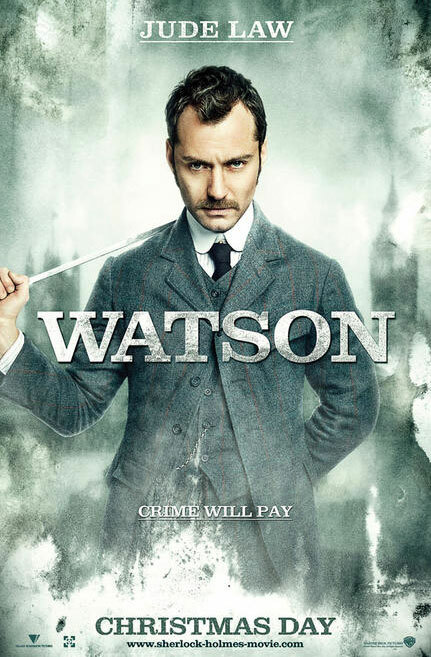 This clip also features our other assessment for today, who's name also happens to be Walter! Walter, a year and a half old Carin Terrier mix, mixed it up with the other high energy pups in our Med. Roll this morning. While also taking time to take in the new smells, and refereeing the action, he had to jump in on some of the fun too! I'm sure that Walter will be having even more fun in time, as he builds positive associations with not only The Fort itself, but with the dogs and employees that spend their time with us. Thanks again for reading and don't forget to grab some free samples of our 3 flavors of new dog treats! We have started carrying Fromm's Dog Treats and they are available in our lobby. check out the link for more information about these deliciously organic appetizers! To laugh out loud at these funny dog .gifs I have collected... Assuming they strike your fancy. Today we got in touch with our reggae roots and welcomed Bob Marley to our pack. Keeping in line with his musician namesake, He was jamming all morning long with Jackson and Emmett, a couple other Med. Roll. Fort Fido friends. A quick clip showing Jackson, Emmett and Bob marley doing their thing in our medium roll, while listening to Bob Marley & The Wailers 1978 hit "Is this love". What a great addition to an already amazing mix of pups here at our daycare. In Other exciting news, we received a new shipment of awesome new toys, and we now carry Fromm Dog Treats in a few different flavors, so be sure to grab a sample from the lobby, to see how your furry friends like them, and be sure to let us know! Last Saturday we assessed Finn. 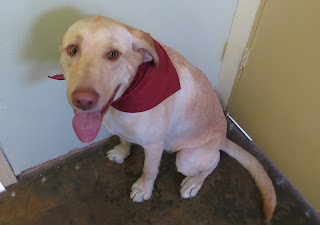 He is a one and a half year old, Yellow Lab. He had a great first day, and played well with the other dogs in the big roll. We hope to see him again soon. Here are a couple of clips from the medium roll today. Featured in these clips are Blue, Gracie, Louis, Lucy, Scandi and Summer. Heroic and News Worthy Pups! First on our list of awesome dogs today, we have Rocky the "Dopey and loveable" Bloodhound. Rocky has been working with Normandy Park Police for 7 years, (people years that is) And recently helped his handlers find a 7 year old girl who had been missing for several hours. What a great job for a pooch! Another story of a chilling rescue after a severe storm and tornado hit in New London. Paula, relaxing in her vacation trailer, was scooped and flipped upside down by the tornado. When her pooch George, a sheltie and corgi mix came to her rescue. George not only found the hole to come and comfort his Mama, but then led her out of the wreckage to safety. Our last heroic Pup for today is one who rescued a fellow Senior Border Collie named Bagels, from a hazardous situation where Bagels couldn't turn around to swim back to shore after having grabbed a stick that was far too long for proper water travel. :) Such an amazing story of the compassion that dogs can show, not only to their companions on the human side, but to their animal brethren as well. In other news, a new volunteer service in Madrid is cleaning up their area by mailing back uncollected dog waste, that uncouth owners have left behind. A "poo patrol" if you will. A very positive reminder that even though your dog has left it, doesn't make it okay for us to leave it too. In an interesting study performed by the Department of cognitive and behavioral science at the University of Tokyo. Says, that confirms Yawning is contagious. Not only contagious between us humans, but to our furry friends as well. Also, the study confirms that your pup is more likely to "catch" your yawn, as opposed to your neighbor's or any stranger. Thanks again for reading and be sure to check back on Monday to stay updated with the happenings here at The Fort. Meet Shadow! Now fortunately for us, he isn't anything like the once popular comic character, he is much more easy going, happy, and fun lol. 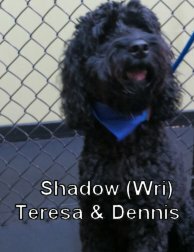 Shadow is a two year old, thirty-five pound, black colored, Labradoodle. He had his assessment today in the Medium Roll, and is staying with us for Overnight Boarding. Shadow is a very nice dog that has been socialized well. He is the younger "dog brother" of Fort Fido Friend Chance... The two make an extremely amusing and striking duo, due to their cheerful personalities and contrasting colors. Shadow is doing well with the pack, and has been enjoying his stay since early this morning, playing quite a bit with Gracie and Yuki, among others. Keep up the first-rate work there Shadow, you are doing great.... O, and Chance, keep an eye on him would ya? Thanks! Haha. P.S. A special congratulations goes out to Teresa & Dennis on their new marriage! Hooray! Here are some awesome pictures from our pal, Diego, from his current pad in Germany... I've been told, we may get to see the old fella again someday, once he and his family return to the states. Thanks for the pictures dude, be well! Topping out our "Cute O' Meter" lol, is Fort Fido mainstay, Rainier, lounging around with his "niece and nephew". Super cool! It looks like he has had quite a summer of babysitting haha. Thank you for the great photo. P.S. As always, if any of you out there have pics of your pooch, please send them in! Today we welcomed Ruby to The Fort. 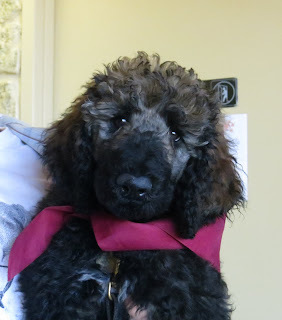 Ruby is a 4 month old, phantom sable colored, Standard Poodle. She did great for her first day and left all tuckered out and ready for a good nap. We will see her again soon for boarding. Here are a couple of video clips from this morning. This first clip from over in the medium roll features the two adorable puppies Blue (the Old English Bulldog) and Summer (the German Shepherd/Mastiff). Blue and Summer have both been attending daycare here for about 2 months and as shown in this video, they are both having a great time! And in this second clip are Gus (the Newfoundland) and Red (the Labrador) from the Big Roll. 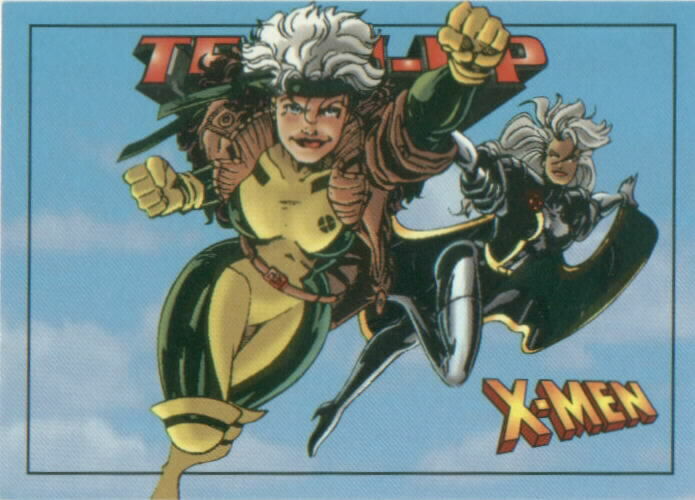 Rogue and Storm!! This dynamic duo came and assessed this morning and passed with flying colors. A pair of Lab/Boxer mixes that are a sweet 5 months old. Ready to rip it up in our medium roll, they got straight to the action with our other pups Max, Marlee, and Walter. Not unlike the comic book "X-men", these two live, eat, and play together everyday. Thundering around the play area, Storm loved to test the waters with his new friends, playing chase and chasing in return. Keeping in line with her namesake, Rogue stood back a bit and watched, learned from, and generally followed storm's footsteps throughout the morning, nosing around and getting used to the surroundings, while waiting for her chance to steal the show. Over all, these dogs were a blast to have around, and I'm sure they will grow to be an amazing pair of dogs here in our pack. Three sweet clips from The Fort Today. Two from The Medium Roll, you can spot Beau, Kingsley, Max, Sophie & Yuki, among others, "ripping it up"! In this clip from the Big Roll, Martin Skully, and Fort Fido "Bad-Boy" (only kidding lol) Zipper, play it up all tough-like. It is all in good fun of course.